From 1972 till 1975 I served as Navigating Officer in the RRS (Royal Research Ship) “John Biscoe”. This was an interesting appointment, a huge contrast from the cargo liners I had served in hitherto. Each year we would make a voyage to Antarctica, sailing from Southampton in September, returning in April. During that voyage we would be engaged in the relief and re-supply of the British scientific bases in Antarctica. The ship carried 28 crew in total, plus a further 28 “Fids”. These were the scientists and support personnel being transported to or from their base. Generally they would serve two years on base. 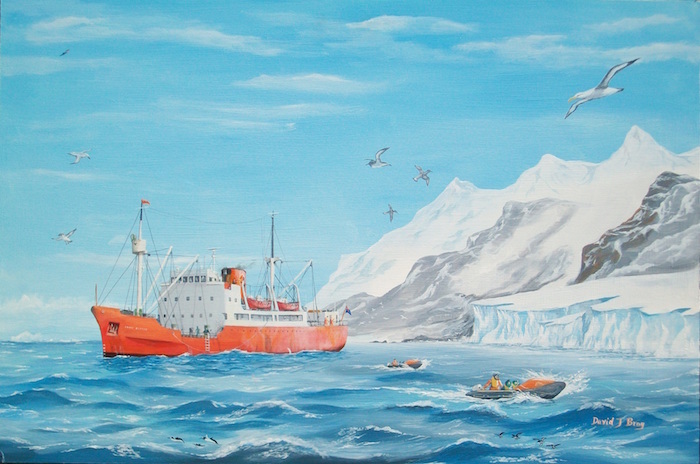 “Fids” is an acronym for the Falkland Islands Dependencies Survey, the predecessor of the British Antarctic Survey. Base personnel will forever be referred to as “Fids”. In addition to resupply of the bases, we engaged in a variety of scientific work, supporting scientists undertaking botanical, biological or geological survey work. A lot of time was spent working the various boats carried. For transporting scientists onto beaches in various places we operated three “Gemini” craft; 16 foot inflatable boats powered by a 40hp outboard. Other work was carried out by a 24 ft diesel launch which towed a 30 ft open barge or Scow. These latter craft were extensively used for carrying base stores and supplies ashore at bases where the ship perforce had to lie at anchor. 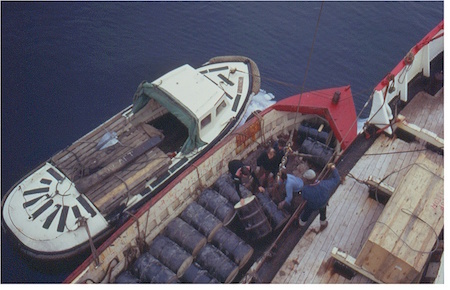 I spent a lot of my time in the launch and scow, shifting cargo by hand. 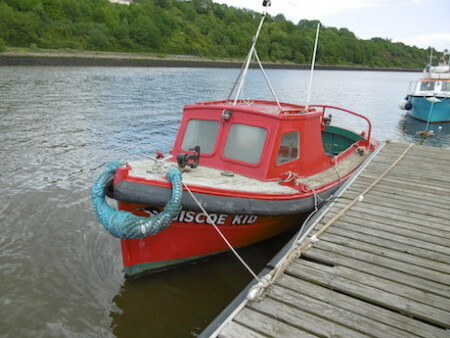 The”John Biscoe” was eventually sold by BAS in 1991 having served 35 years. She was replaced by the new “James Clark Ross” which is still serving BAS. “Biscoe” soldiered on in various roles for new owners for a few years, but eventually succumbed to the scrapman. Fast-forward to 2012. In June of that year there was held the Jubilee Pageant of boats on the Thames. Many will remember it as a day of foul weather, continuous rain, blowing hard and cold. Typical British summers day, really! I watched the coverage on TV, spitting feathers at the utterly appalling coverage provided by the BBC. It seemed that they were doing everything to minimise the coverage of the craft involved and the people who manned them. Brainless presenters gabbled on endlessly about nothing. But….I learned something. We were shown the hat…Yes your actual hat worn by Admiral Nelson at the Battle of Waterloo! And to think that I had laboured under the misconception that he had died during the Battle of Trafalgar years previously! You live and learn. But I was appalled at the treatment of a group of Arctic Convoy veterans who had gathered on board HMS “Belfast”. These venerable souls had completed what was described as “The worst journey in the world” during World War 2, and would have had a tale to tell. But the young blonde presenter just said collectively “I hear you were all in the Arctic Convoys”. Some of them replied in the affirmative. She then just said “That must have been scary” and walked away. Never have I seen such rudeness and disrespect! The boats sailing in the pageant were generally ignored by the BBC. This was a real pity when one considers the supreme efforts made by many to get the boats there, and to sail them on the Thames. This was a real collective effort involving thousands of people, and was totally ignored. Many historic craft were on show, but nothing was mentioned about any of them. At one point the camera showed a broad angle shot of a large group of boats. “These are the working boats” we were told. No further description or explanation. The shot lasted about one second, and that was it. But I had spotted something. I had taped the TV programme, so I was able to rewind and pause. And, yes, I was correct. There was my old launch from the “John Biscoe”! What on earth????? How did she get there? “Biscoe” had been scrapped twenty years ago. I was utterly flabbergasted! I checked in the listing of boats in the newspaper, and, sure enough, there she was. Now called “Biscoe Kid” (she never had a name in my day..she was just “the launch”). 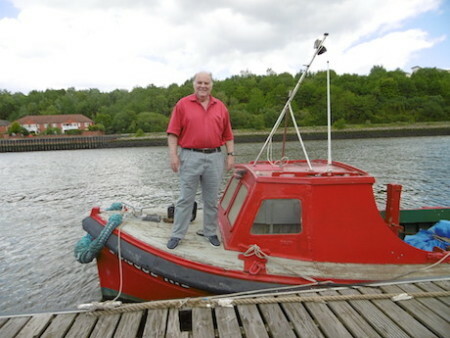 It appeared that she was being used as the Harbourmasters launch at the small port of Eyemouth in Berwickshire. I was intrigued. Some time later I rang the Harbourmaster, and he confirmed that he was the owner, but she was in poor condition. Although she had been sent to the Jubilee pageant on the Thames, and had sailed successfully down the river, a lot of work was needed to restore her to fully operational condition. In 2015 I was appointed to the “Boudicca” as guest speaker. The cruise was a round-Britain, starting and finishing in Rosyth. As this was going to be a 440 mile journey from Lowestoft to join the ship, we decided to break our journey. Eyemouth might be a good place. I rang the Harbourmaster, only to find that he had sold the launch, and she was now at Gateshead on the Tyne, at the Friars Goose boatyard. I wrote to the yard (I didn’t have a name) and received a phone call from the new owner of the boat. We were welcome to call in and see the boat. We booked into the hotel on the waterfront adjacent to the yard. So, after 40 years, I renewed the acquaintance with my old launch. She was in the water with considerable restoration work to be done. When complete she will serve as the yard workboat, a task to which she is ideally suited. Several people were involved in the care of the launch, and they made me thoroughly welcome. I was able to explain a few things about the boat they didn’t know. At that time she was looking somewhat careworn, but it was obvious that she was in good hands and will be well looked after. It was interesting to discover that several of the local people owning boats at the yard had worked for BAS, although nobody that I knew. My thanks to Steve, Dava, John and Brian for showing me around the yard, and taking me on board my old friend.